Gary L. Davis, age 70, of Janesville died on Sunday, September 9, 2018 at SSM Health St. Mary’s Hospital-Madison. He was born in Janesville on July 24, 1948, the son of the late Elmer and Frieda (Solles) Davis. Gary attended Janesville High School and served his country in the US Army from June 14, 1968 until he was honorably discharged on June 12, 1970. On June 26, 1976, he married Carol J. Gallmann at First Lutheran Church in Janesville. For over 42 years he worked at Monterey Mills retiring in July of 2016. Gary was a very avid sports fan. He enjoyed following the Packers, Brewers and the Badgers. In his younger years he was actively playing softball, bowling, and golfing. He loved spending time in the outdoors, especially at his trailer near Wisconsin Dells, an area he truly enjoyed. He was proud of his flowers at his trailer and spent many hours tending to them. Gary was a very kind, quiet, patient and loving gentleman, who was very supportive of his family and his children’s activities when they were younger. 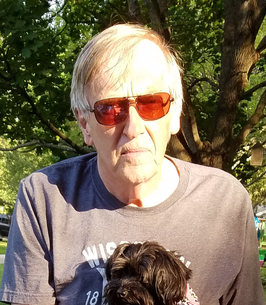 Gary loved animals and enjoyed caring and spoiling his dogs over the years, especially his current dog “Jordy” who was named after Jordy Nelson. He is survived by his wife: Carol and two children: Jamie (Dan Cerny) Davis and Shaun Davis; his siblings: Yvonne (Robert) Mezera, Bruce Davis, and Carol (Darrell) Oliver; several nieces, nephews, other relatives and friends. In addition to his parents, he was predeceased by his brother: Richard Davis. Following Gary’s wish private services will be held. To send flowers to the family of Gary Lee Davis, please visit our Heartfelt Sympathies Store. Carol, We are so sorry for your loss. Gary will always be in our memories of all the great times that we had camping. George also has great memories of bowling on the same team with Gary. Please let us know if there is anything that we can do to help you out now or in the future. Our prayers are with you, Shaun & Jamie during this trying time.